Newcomer Family Obituaries - David F. 'Tub' Briner, Sr. 1936 - 2019 - Newcomer Cremations, Funerals & Receptions. 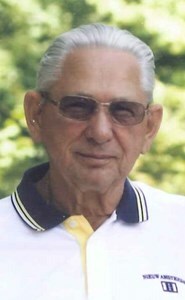 David F. "Tub" Briner, Sr.
David “Tub” Briner, Sr., age 82, of Maumee, Ohio passed away Wednesday, April 3, 2019 at St. Luke’s Hospital. He was born November 11, 1936 in Napoleon, Ohio to Fred and Ida (Kinder) Briner. Dave attended Liberty Center Schools where he met his wife, Pat. He was a person who could make friends with anyone, he never met a stranger. Dave was a member of Northern Light Lodge #40 in Maumee. He was a 61 year member of International Brotherhood of Electrical Workers, where he worked as a Journeyman Lineman for 41 years. Dave worked with High Voltage Systems for 27 years, Romanoff Electric for 6 years and retired in 1993 after 8 years from Toledo Edison. Dave enjoyed traveling in his early years and going on cruises. He loved his John Deer tractor and mowing the yard. Dave was an avid Detroit Lions and Ohio State Buckeye fan. Dave is survived by his loving wife of 61 years, Pat Briner; sons, Randy, Jeff (Robin) and Dave, Jr.; granddaughters, Marlow (Josh) and Ariel; great-grandchildren, Michael, Riley, Degan and Zane; sister, Lila Myers; grand dogs, “Cally” and “Luckey,” and many nieces and nephews. In addition to his parents, Dave was preceded in death by his brothers, Robert and Dennis Briner. The family will receive guests Monday, April 8, 2019 from 2:00 p.m. - 8:00 p.m. at Newcomer - SW Chapel, 4752 Heatherdowns Blvd. (419-381-1900). Funeral Services will begin Tuesday at 10:00 a.m. at the funeral home. Burial will follow at Heath-Colton Cemetery, Liberty Center, Ohio. Memorial contributions may be made to the Kidney Foundation or the American Cancer Society in Dave's memory. To leave a special message for Dave's family, please click on the share memories tab above. Add your memories to the guest book of David Briner, Sr.. I was very sad to hear that Tub passed away . I have so many fun memories of you all . Your family has a very special place in my heart . Hug your Mom for me . Lots of Love , hugs and prayers . My condolences to you and your family at this time. May the God of peace, comfort you and your family at this time. Please accept my deepest sympathy. May you find comfort from Gods promise to reunite us by means of the resurrection. John 5:28,29. My deepest sympathy goes out to the Briner family. A lot of fun memories from years ago will never be forgotten. My heart sank when I heard about Tub. I remember you coming to our house and us going to yours when we were young. I actually thought that we were family. I thought that he was just another uncle because the family was so large. I thought that Jim and Charlene Renolds was family as well. The last time I talked with Uncle Charlie he told me a hunting story that Tub was involved in. I guess that made me realize how long the family knew him. I will always have his smile in my memories. He always had an ear to ear smile. He will be greatly missed and never forgotten in my heart. I have known the Briner family for a long time, Tub was a great man. We always had lots of laughs at Marlow & Ariel's birthday parties, then as the years went on it was the great grand kids birthday parties. We always thought of them as our family. Tub will be forever missed by many. I sure hope he looks my son Josh up, they can have some fun together.